I recently had the privilege to review two new books from Rick Warren. God’s Big Plans for Me is a children’s 40-day devotional, and God’s Great Love for You is a richly illustrated book for young children. When I decided to review the book, God’s Big Plans for Me, by Rick Warren, I saw that it was a forty day devotional, and that the stories were in chronological order. This is a unique way to move children through the story of the Bible, from the very beginning (pp. 8-11), and stretching into the endless eternity in the kingdom (pp. 220-223). Even though it’s intended for children, I can see this book as being a great book for new believers, because it starts at the beginning, with the fall in the Garden of Eden, and early on, reveals our need for a Redeemer. The storybook devotional, God’s Big Plans for Me, moves steadily through the Bible, giving devotionals for each major event in the Bible, and I believe importantly, in the order in which it was written. The daily devotional, God’s Big Plans for Me consists of 40 daily devotionals, and just like the number 40 represented a time of testing in the Bible, so are these stories about those whose faith was tested, some to the breaking point. These accounts may help children deal with similar circumstances in their life. During the times when they’ll be tested and tempted, they’ll come to know that when no one else watching, God always is. Even so, they’ll learn that when they make bad choices, much like the heroes of the faith, God will never forsake them or stop loving them. If anything, God’s Big Plans for Me, and the illustrated book for young children, God’s Great Love for You, will prove from Scripture that no matter what they do, God will never love them any less or love them any more based upon what they do. As mentioned earlier, the forty-day devotional, God’s Big Plans for Me, exposes children to the gospel, and reveals God’s unconditional love for them, and what it means to put their trust in Christ, that they might be saved. This hard cover devotional shows the cause and effect relationship of sin, and the consequences of those choices. Just like the Bible, this devotional uses heroes of the faith and highlights each character’s strengths and weaknesses. Additionally, it shows how each of these biblical heroes repented and asked for God’s forgiveness (Psalm 51), which is just what God requires of us (1st John 1:9). The child or new Christian who knows little or nothing of the Bible will benefit from this book and it will give the reader a firm grasp of the gospel by the time they are finished reading. The reader should know the gospel well enough by the time they’re finished reading, God’s Big Plans for Me, that they will be able to share it with others. She immediately mentioned how beautiful the illustrations were and thought they would capture and hold a child’s attention. 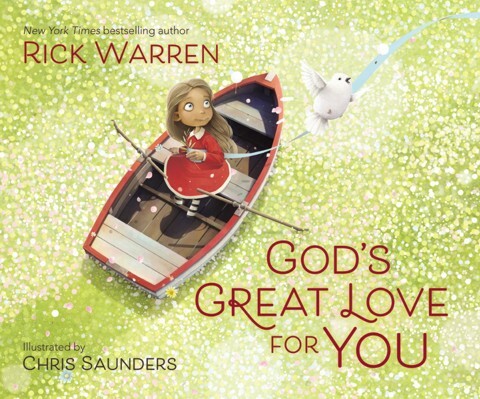 She noticed that the illustrations enhanced the idea of God’s infinite love for us and, not just in the children’s book, God’s Great Love for You, but in the devotional, God’s Big Plans for Me as well. She thought the images were perfect for the time setting in which these biblical accounts took place. She was greatly impressed with “just one sentence per page” in God’s Great Love for You which would make it easy for the child to read it (or be read to). When she looked at the storybook, God’s Big Plan for Me, she thought it would be easy reading for most 3rd or 4th graders, but thought it would be interesting, even for older children. She particularly liked how they ended each daily devotional with Bible verses and open-ended questions, which should whet their appetite for even more. She noted that if it causes them to open their Bible, then it has achieved its purpose. As a teacher, she liked the diagnostic questions at the end of the devotional. She thought they would add to their understanding of God. As the pastor of a church, I thought it would be negligent of me to not let our teachers see this book. One lady who had not only taught Sunday school, but led “Children’s Church,” for dozens of years, thought that God’s Great Love for You would be perfect for the nursery, or for reading to the preschoolers, and even for reading in bed. She liked how God’s Great Love for You has the focus is on the right place…that God’s love for them is deeper than the deepest ocean, and higher than the tallest mountain, and even extends into the deepest, darkest places a child (or we) might find themselves. She also thought Chris Saunders did such a fine job with his illustrations that it not only captures the young child’s attention, but it holds them there to absorb such powerful statements against the backdrop of beautiful images. She noted that God’s love jumps out of the pages to meet the reader, reassuring them that His love is never ending, and endures forever, just like God does. They will read that God is still there, He still loves us, and even though He is such a big and all-powerful Creator God, He still has regard for a small child. God’s Great Love for You would add value to any church library. Great Teaching Tool – The Bible is clear that we must teach our children, and I believe, our grandchildren, and teaching children doesn’t end when they become adults. It’s just that it shifts into more of a counselor role than anything, but while they’re young, parents (foster parents, grandparents, etc.) are told, “You shall teach them to your children, talking of them when you are sitting in your house, and when you are walking by the way, and when you lie down, and when you rise” (Deuteronomy 11:19), and books like the devotional, God’s Big Plans for Me, and the children’s illustrated book, God’s Great Love for You, can help parents accomplish that. It does that by putting a tool into their hands to get the Word of God into their hearts in the hopes that the seed will take root and grow deep, and then bear fruit. I think the author realizes, the more you get them into the Word of God, the more the Word of God gets into them, and these two books by Rick Warren can be an invaluable aid in letting them store up God’s Word in their hearts so that they might not sin (Psalm 119:11). Unique Gift – In the very first pages of the books, God’s Big Plans for Me, and God’s Great Love for You, there is a place where is says, “Presented to” and “With love from,” and a place for the date, making these a unique gift that will have consistent, redeeming value, and which may become a family memento. My Favorite – I related best in God’s Big Plans for Me, with the story of the Prodigal Son, or the “Lost Son.” Why? Because I was a prodigal! I forsook my God and my family, but that was when I was blind and could not see. Grace had yet to have it’s amazing work on me. Through grace God redeems even the “Lost Son”. When you present these books to your children, let them explore them at their own pace. Allow them to browse and enjoy the illustrations, and don’t worry if they don’t read it in order; just be glad they’re reading it! Not only does the children’s daily devotional, God’s Big Plans for Me, and the children’s book, God’s Great Love for You, show God’s love for them, they show God has a purpose for them. A purpose which I believe they’ll find out after reading these great books. Resources: Scripture quotations are from The Holy Bible, English Standard Version® (ESV®), Crossway Bibles. (2007). ESV: Study Bible : English standard version. Wheaton, Ill: Crossway Bibles. Used by permission. All rights reserved. Warren, Rick. 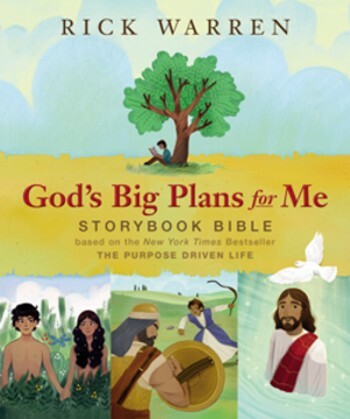 God’s Big Plans for Me Storybook Bible. (Grand Rapids, MI: Zondervan Publishing, 2017). Warren, Rick. God’s Great Love for You. (Grand Rapids, MI: Harper Collins Publishing, 2017).